Christmas may be over, but seasonal books are still showing up on bookshelves, real and virtual. Harlequin offers this trio of stories about lovers reunited when a major winter storm hits Tucker’s Point, Maine in early January, forcing the lovers who have been apart for various periods of time ranging from six months to ten years into one another’s company. The storm, the reunion theme, and a thread concerning a child lost in the storm link the three stories. In “Heart of the Storm” by Shannon Stacey, Brody Rollins plans a quick, low-key visit to the hometown to which he has not returned in five years. His purpose is to meet his sister’s two-week-old son. Brody expects to spend one night with his sister and her small family, pay a brief duty visit to his parents, and get out of town as rapidly as he can. Instead, when his sister’s home loses power because of the storm, he ends up seeking shelter with her, her husband, and their baby at the local emergency shelter in an elementary school. One of the volunteers in charge is Delaney Westcott, the girl Brody left behind him with only a note to tell her that none of her dreams for the two of them were coming true. When Brody and Delaney meet again, it is immediately clear that the jagged edges of that goodbye still cut both ways, but five years of silence is a lot to overcome. Have the years softened the intensity of Brody’s dislike of Tucker’s Point and his fear of replicating his parents’ lives? Can Delaney forgive him for walking away with no explanation? Is an HEA for these two possible? In “Seeing Red” by Jennifer Green, Whitney Carr has returned to Tucker’s Point at the urging of her mother and sister who think the “treasure” Whitney’s deceased grandmother left in her house might be truly valuable. Whitney left town at eighteen shortly after her high school boyfriend, Henry “Red” Redmond dumped her with no explanation on the night of their senior prom. Whitney still retains enough of her Mainer pragmatism to arrive prepared for the storm with food, candles, and a heat source, but she’s not prepared for the emergency crew member who awakens her in the wee hours of the morning to be Red nor for the feelings that the sight of him awakens. Red realized long ago that he made a mistake in not telling Whitney the truth about why he was setting her free, and he’s not about to miss his second chance with the only woman he’s ever loved. If these two can learn to be fully honest with one another, they just might deserve their HEA. The lovers in the third story, “Land’s End” by Barbara Dunlop, have been apart for a much briefer period of time. Six months ago, Tessa Ambroise returned the engagement ring that she had been given by Colton Herrington of the Boston Herringtons. Tessa is in Tucker’s Point going through Land’s End, the twenty-six–room stone mansion built by her ancestors on twelve acres of prime beach front land nearly two centuries ago. The death of her great-aunt less than two months earlier has left Tessa and her brother heirs to the property. Since her brother is a busy doctor in Atlanta, Tessa volunteered to do the inventory at Land’s End. She may still think of her former fiancé; after all, it’s not easy to forget the perfect man—wealthy, good-looking, gentlemanly, and a skilled lover. But Tessa could never live up to his standards, and she grew tired of trying. She’s confident that she did the right thing in breaking things off. She doesn’t expect to see Colton again, certainly not at Land’s End. But she doesn’t know that Colton, with her brother’s full cooperation, has his eye on Land’s End as the site of the next Herrington Hotel and Resort. When her brother and Colton both arrive in Tucker’s Point, Tessa has a lot of questions, not all of them about real estate. No one expects the group, plus best friends, snobby neighbors, and adolescent athletes to end up iced in at Land’s End. And Tessa doesn’t expect the storm to reveal new and fascinating aspects of Colton Herrington. I’ve been reading Jennifer Greene’s (aka Jeanne Grant) books since the 1980s, and I’ve been a Shannon Stacey fan since I read her first Kowalski novel. I was delighted to discover an anthology that included novellas by the two of them. The premise that links the stories is one to which most readers can relate, and I found it especially interesting that the stories show three different settings during the storm—an emergency shelter, a modest house that has been empty for months, and a mansion. The town of Tucker’s Point itself is a real presence in the first story where nameless, interested citizens watch the progress of the romance. It is represented by distinct personalities who remember Whitney and Red as a couple in the second story, and it serves as mere background for the Ambroise estate in the last one. I enjoyed the three stories to varying degrees. I liked the characters in “Heart of the Storm,” as I generally do in Stacey’s stories, but I thought the heroine forgave the hero too easily. I believe one can realize a mistake in a single moment’s realization, and perhaps breaking off a relationship in a note seems less callous to a generation conditioned to celebrity breakups via text and Twitter. But I had problems believing the entire direction of a life can be changed so quickly, and I wanted to see more serious groveling on the hero’s part for what seemed to me a cruel, cowardly act. I liked parts of the Dunlop story a lot. I have seen friends and family try to become someone they are not in order to live up to a significant other, and thus that part of the story rang true. I also appreciated the rich humor in the story. But I felt the secondary romance needed more development to keep it from being merely a distraction, and I thought both the Ambroise sibling relationship and the reasons for Colton’s perfectionism needed more development. I think this was a novella that needed a novel’s length to become its best. “Seeing Red” was my favorite of the three because I believed wholly in the reunion. First, eighteen-year-olds are entitled to make foolish mistakes. Common experience and biological research supports the idea that judgment is often flawed at that stage. Then, Red admits that he was wrong in thinking he knew what was best for Whitney. He explains why he acted as he did, but he doesn’t attempt to justify his choice as wise or smart. He also offers heart-melting evidence of his continued devotion. For me, the collection offered an A- read, a B- read, and a C read, which averages four stars--not a bad result for an anthology. 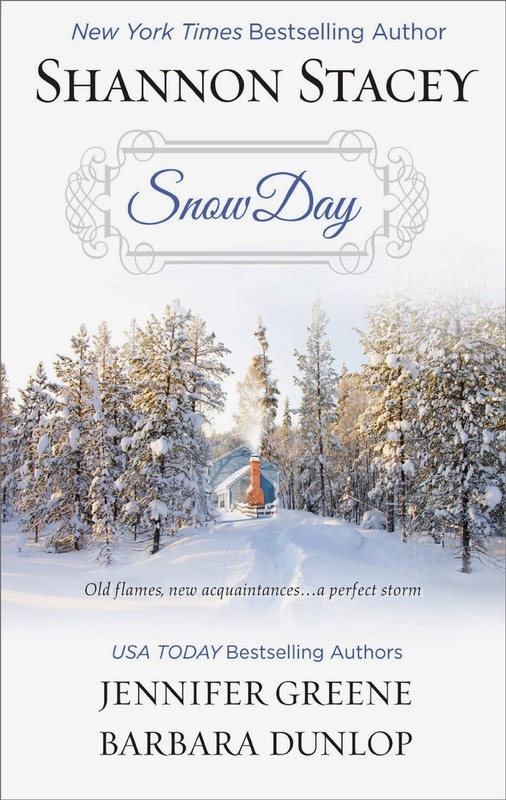 If you are looking for contemporary romance that offers a mix of sweetness and spice, some engaging characters, and a shivery winter setting, you should check out Snow Day. I always enjoy reading your reviews Janga. Thanks, Laurie. You made my day. Great review! I love the cover of this book, its beautiful! Thanks, Quilt Lady. I like the cover too. Great review! will have to look for it Janga... Don't usually like anthology's but this one looks like one I will like.. 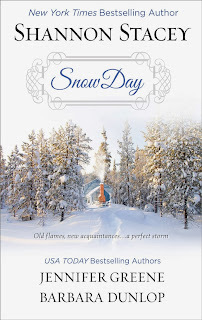 Putting Snow Day on my TBR list while I recover from knee surgery. Pretty cover. A subject-verb error! How did I miss that when I proofread? My apologies. Anthologies are a personal favorite and SNOW DAY sounds like one I need to add to my collection. Thank you for the informative reviews. SNOW DAY goes onto my Wish List.